Insulting the president in Turkey is a crime. Apparently, President Recep Tayyip Erdogan doesn’t like being insulted – and a lot of people are doing it. Critics say Erdogan is abusing the law to stifle any form of dissent. Those who have faced trial for insulting the president include journalists, cartoonists, academics and even schoolchildren. Insulting the president is a crime in Turkey punishable by up to four years in jail. The law was invoked only rarely prior to Erdogan’s election as president 18 months ago. 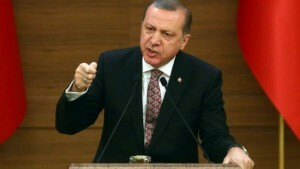 Since he became president in 2014, Erdogan has been trying to reshape Turkey’s constitution to boost the powers of the president, which was previously a largely ceremonial role.